The glorious, fleeting, and quintessential vegetables that easily evoke the feeling of spring are finally here. We are squeezing them into every menu we can find to showcase their distinct flavors. One that always comes to mind is the artichoke. Sometimes they can seem intimidating, even unapproachable, but they will always be delicious. To help you out, we’ve broken down exactly how to enjoy this veggie at its most pure – when it’s steamed. 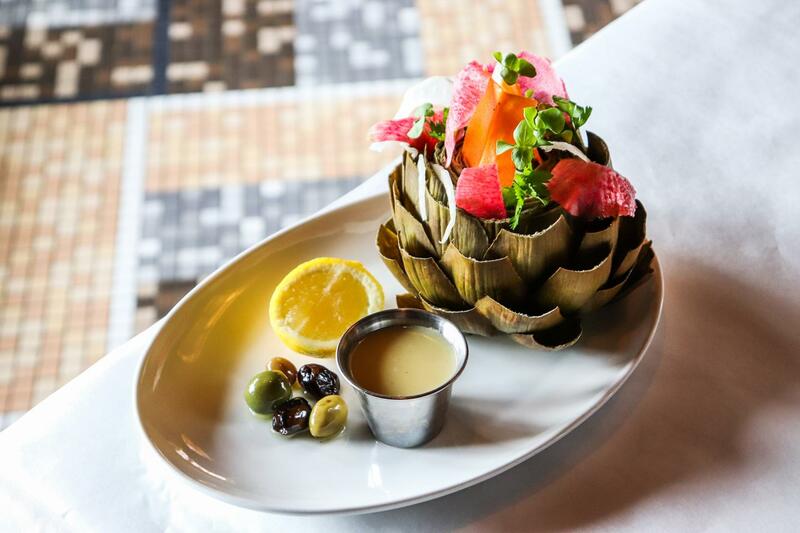 Steamed Artichoke with shaved vegetables and lemon-dijon vinaigrette at Mon Ami Gabi. We expect to see a lot of artichokes popping up on our menus! 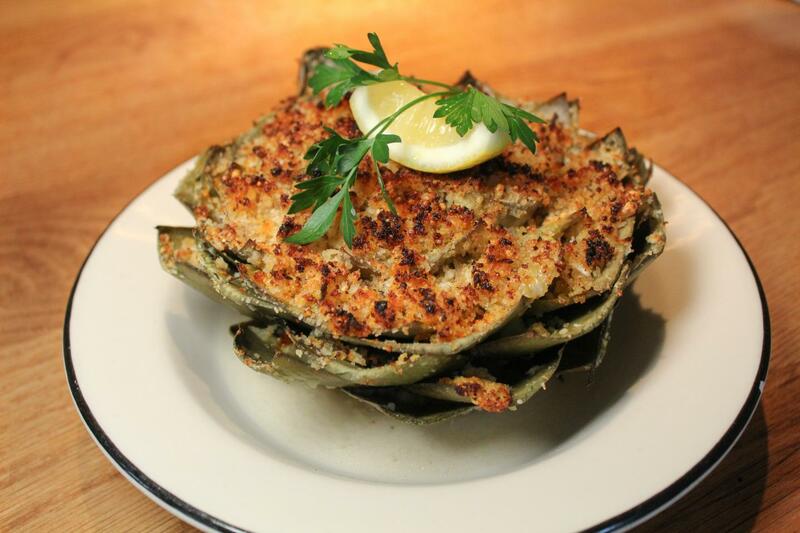 Here are a few of our favorite artichoke dishes you can try at select Lettuce Entertain You restaurants. Seared Artichokes with lemon, herbs, and a farm egg at Osteria Via Stato. Roman-Style Artichokes with lemon aioli at RPM Italian in Chicago and Washington D.C.
Roasted Artichoke with parmesan breadcrumbs, lemon, and olive oil at il Porcellino. 1. Bring a large pot to boil on top of the stove with a perforated insert and lid. 2. Gently trim the top and bottom of the artichokes. 3. Squeeze with fresh lemon juice. 4. Place aromatics in the boiling water. 5. 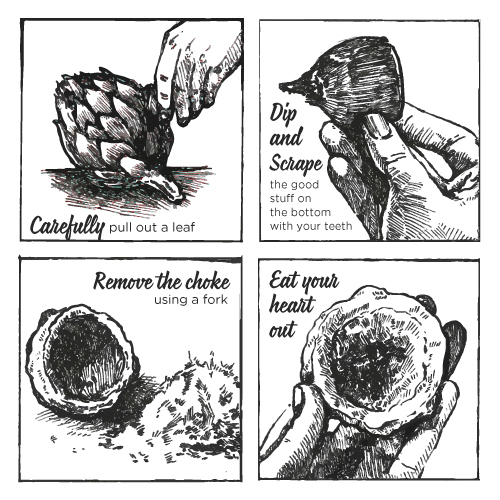 Place artichokes in the perforated pan top side facing downwards. 6. Cover and allow to cook until tender. Approximately 45 minutes. 7. Snip the ends of each leave with scissors. 8. Allow to cool and wrap individually with plastic wrap and chill. 9. Store artichokes bottoms down and gently to maintain shape. 2. Start with dijon mustard in a stainless steel. Whisk in lemon juice and slowly add olive oil. 3. Season with salt and ground black pepper. 1. Peel and shave carrots, watermelon radish and fennel and mix in bowl. 2. Trim artichokes on top and bottom. All leaves must be snipped at top with scissors. 3. Place artichokes on plate, steady the bottom and gently open the leaves. 4. Sprinkle with shaved vegetables, and herbs. 6. Pour 2 ounces lemon-djion vinaigrette onto each artichoke. 7. Sprinkle with flakey salt. More (spring) peas, please! Check out some of our favorite dishes featuring spring peas.